The BEST Luau in Maui! The Feast at Lele is really and truly unique compared to any of the other Maui luaus. For starters, you won't find the usual Hawaiian luau foods served buffet style... instead, you'll experience a multicourse gourmet meal served directly to your table! And believe me, you won't find food like THAT at any other luau in Maui! The food is only one of the many reasons why the Feast is considered by many to be the best Maui luau. So, if you've got the budget for it, I strongly recommend that you give this particular luau some serious consideration. Find out more about why the Feast at Lele is on my MUST-SEE "best Maui luaus" list here! Ticket prices for this one are a bit lower than for the Feast at Lele. That makes this the best luau in Maui to choose if the pricier Feast at Lele is a bit too expensive for your budget. Out of all the luaus we've attended, on 3 different Hawaiian islands, THIS is our favourite by far! The Old Lahaina Luau strives to provide guests with an authentic luau experience... that means no fire dancer! But, trust me, this luau is so amazing that you will NOT miss the fire dancer one bit! Going to the best Maui luau doesn't come cheap. Since the Feast at Lele and Old Lahaina luaus are so popular, they don't need to discount their tickets in order to fill their seats. I just thought I'd mention that so you don't waste any time searching for discounted tickets that don't exist! Also, to ensure that you are able to get seats, it is recommended that you make your reservations for these "best Maui luaus" as early as possible - even 1-2 months before your trip will NOT be too early! Click here if you'd like to know why I recommend you check out the Barefoot Tours site for luau tickets and other Maui, Hawaii activities! 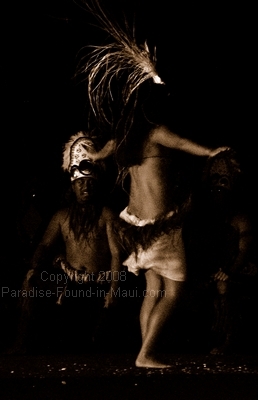 1) Check out my guide to choosing a Maui luau, with a complete listing of all the luaus on Maui! 2) Not sure if you really want to see a Maui luau? Find out why I think a luau in Maui is a MUST-DO at least once in your life! 3) Find out what we think are the Top Things to do on Maui to relax!